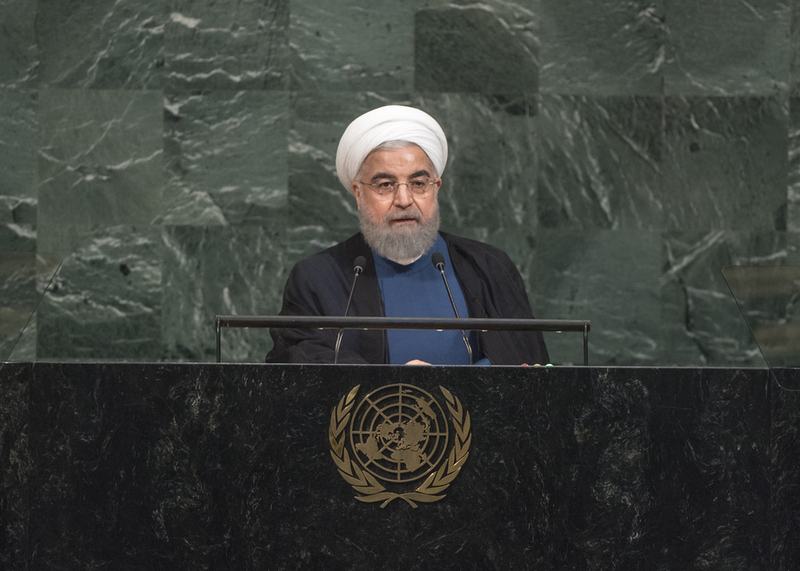 HASSAN ROUHANI, President of Iran, said that, four months ago, more than 41 million people — 73 per cent of eligible voters — had come to the polls and expressed confidence in his platform, which called for moderation, respect for human rights, prosperity and constructive engagement. Their votes exemplified the maturing of the electorate in a society that had enjoyed free and democratic governance for only four decades. Human rights, along with the quest for justice and Islamic values, were among the most pivotal demands of the Iranian people in more than 150 years of struggle. Moderation, the path chosen by the Iranian people, sought neither isolation nor hegemony. The path was one of a just and inclusive peace; not peace in one nation, and turmoil for others. Moderation was freedom and democracy in an inclusive manner. “Moderation is the synergy of ideas and not the dance of swords,” he said, stressing that Iran would never condone tyranny and would always defend the voiceless. “We never threaten anyone; but we do not tolerate threats and intimidation,” he said. The progress of all nations was intertwined, he said, and as such, it was unacceptable that a rogue and racist regime should be permitted to trample on the rights of Palestinians, while Muslims elsewhere lived in misery. Throughout history, Iran had been a bastion of tolerance for various religions and ethnicities. Iran was on the front lines of fighting terrorism and religious extremism in the Middle East, based on ethical, humanitarian and strategic reasons. It did not seek to restore its ancient empire, impose its official religion or export revolution through the force of arms. Iran was so confident in the depth of its culture, the truth of its faith and the longevity of its revolution that it would never seek to export any of them through the “heavy boots of soldiers”. He said the Joint Comprehensive Plan of Action, the result of two years of intense multilateral negotiations, had been overwhelmingly applauded by the international community and endorsed by the Security Council. It could become a model for global interactions based on mutual constructive engagement. Iran had opened its doors to engagement and entered into other agreements with advanced countries in both the East and the West. Yet, some had deprived themselves of that opportunity and had instead imposed sanctions. “We were not deceived, nor did we cheat or deceive anyone,” he stressed. While Iran had continuously rejected nuclear weapons, it was reprehensible that the Zionist regime threatening the region with its nuclear arsenal had the audacity to preach to peaceful nations. Iran would not be the first country to violate the Plan of Action, he declared, but it would “respond decisively and resolutely to its violation by any party”. It would be a pity if the agreement was destroyed by “rogue newcomers to the world of politics”. By violating its commitments, the new United States Administration only destroyed its credibility and undermined international confidence. The ignorant, absurd and hateful rhetoric, filled with ridiculous baseless allegations, uttered before the Assembly yesterday contradicted demands that the United Nations bring Governments together to combat war and terror. Iran’s defence capabilities were solely defensive, he said, used to prevent “adventurist tendencies of irrational aspirants”. Extremist violence in the region had been exacerbated by military interventions of outside actors — the same Powers attempting to sell their weapons to Governments, while accusing Iran of fomenting instability. Foreign intervention and the imposition of “alien wishes” on the region’s people would only widen and deepen crises. The United States should explain to its people why, instead of contributing to peace and security, it had only brought war, misery, poverty and the rise of terrorism and extremism. In sum, he said his Government would continue to enhance the country’s entrepreneurial environment, protect intellectual property rights, improve corporate governance and engage in a robust campaign against money-laundering. The representative of Iran replied to remarks by his counterparts from the United Arab Emirates, Saudi Arabia and Bahrain, and echoed by others, saying the former had made unfounded allegations against his country, resorting to the same lies as in past sessions. While the United Arab Emirates and Saudi Arabia had long employed interventionist policies that brought about death and destruction across the region, they had the audacity to accuse Iran of supporting terrorism. The three islands of Abu Musa, Greater Tunb and the Lesser Tunb were part of Iran’s sovereign territory, he stressed, rejecting claims to the contrary. In line with its policy of good neighbourliness, Iran was willing to engage in discussions on those matters, but its sovereignty was not negotiable. Noting that the term “Persian Gulf” was the appropriate name for the body of water in question, he responded to accusations by Bahrain’s representative as “desperate efforts” to cover up that Government’s human rights violations and justify its blatant trampling of its own people. Speaking in exercise of the right of reply, the representative of the United Arab Emirates and Bahrain responded to Iran.